Condos Coming on Pickett Road? The IDI Group Companies, a prominent metropolitan Washington area builder and developer, is proposing to build condominiums on approximately 3.8 acres within the Mantua Professional Center on Pickett Road. The proposed condominium units would be located within this parcel near Pickett Road and Thaiss Park. The Mantua Professional Center was originally approved in 1975. The original approved General Development Plan (GDP) allowed for 62,000 square feet of office space in 21 condominium-style buildings of one to two floors and a single 12-unit apartment building. The plan was amended in 1985 to allow an additional 40,000 square feet of office space by removing the apartment building and replacing some of the smaller office buildings with a larger three-story building with a parking deck. By 2003, only 34,000 square feet of office space in the approved GDP had been built. 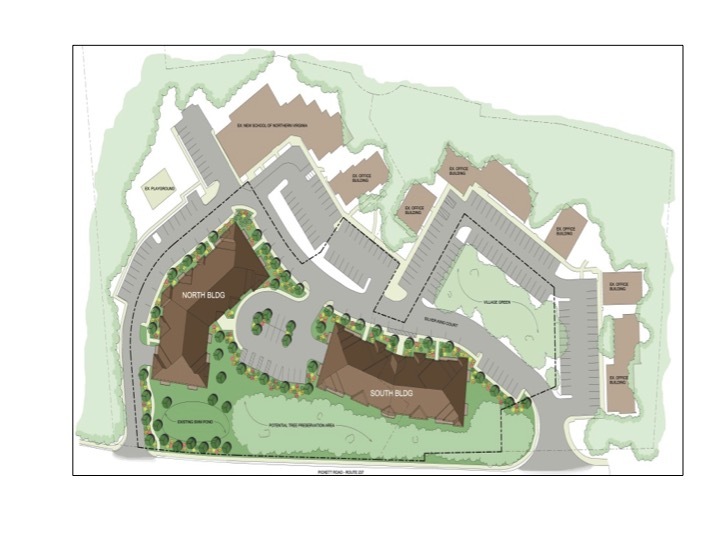 In 2004, another plan amendment was approved to allow the New School of Northern Virginia, then occupying approximately 11,000 square feet of space in the complex, to expand one of the existing smaller office buildings for school use, in place of two unbuilt townhouse-style office buildings. This resulted in a net decrease of about 3,000 square feet of development in the GDP. 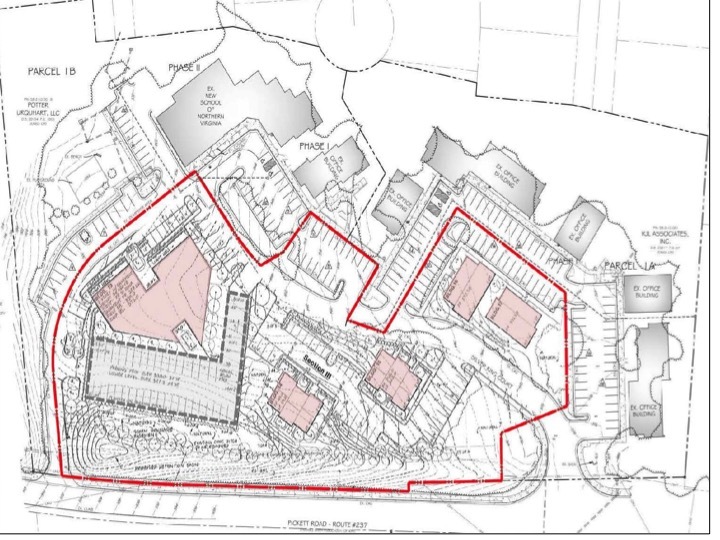 The parcel containing the buildings occupied by the New School of Northern Virginia was sold and the other two parcels are still owned by the original developer of the complex. Very few details about the project are currently known, as it was just presented to the City Council in a work session on October 7, 2014. However, as presented to the Council, the proposed development will consist of 80 condominium units in two buildings (the brown buildings in the rendering to the right). The site would be accessed from the existing internal road network and existing curb cuts on Pickett Road. Parking to serve the residential units would be distributed in parking garages below the two buildings, a small surface lot, parallel spaces along Silver King Court and existing head-in spaces. The Fairfax City Citizens for Smarter Growth will track this project as it moves through the review and approval process. If you have comments on the proposal you can sign up on Facebook at https://www.facebook.com/CityOfFairfaxCitizensForSmarterGrowth. You can also join the Group by going to the web site at https://fairfaxcitysmartergrowth.wordpress.com/. You’ll see where to join on the right side of the page.